Crestview Crossing, a proposed development in the works for more than a decade on Highway 99W across from Providence Newberg Medical Center, will take another step toward fruition this week as the subject of a public hearing before the Newberg Planning Commission. 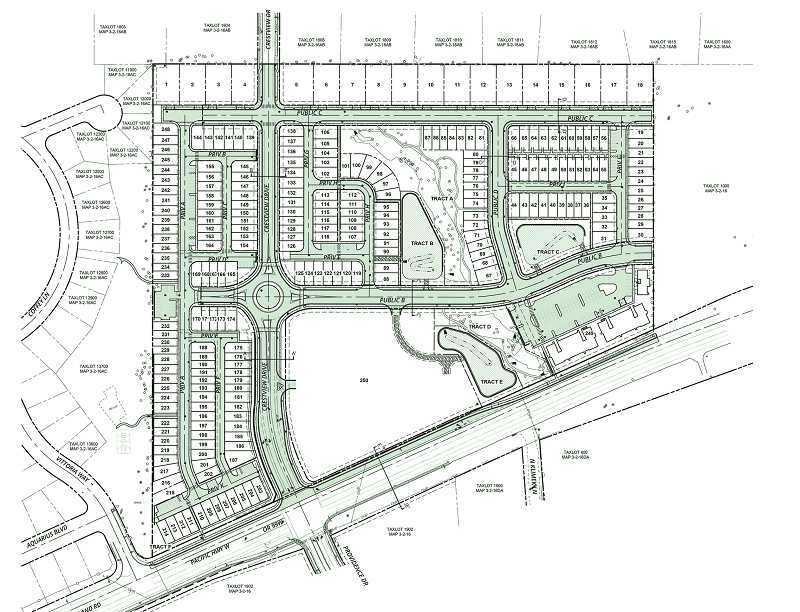 Originally proposed around 2006, the development was to be a collection of commercial and residential properties bisected by the long-anticipated continuation of Crestview Drive with Highway 99W. The project came to a screeching halt when the recession struck the country, but was revived in 2014 when Tualatin-based Gramor Development signed on and preliminary development work began. Progress, however, then slowed again, as issues arose concerning streams and wetlands on the 33-acre property. The Beaverton developer on the project, 3J Consulting Inc., is working with the Army Corps of Engineers and the Division of State Lands to gain the necessary permits for wetlands mitigation, according to Newberg Community Development Director Doug Rux. Although the ambitious project remains ostensibly the same as when first proposed more than 10 years ago, the application that will come before the Newberg Planning Commission at 7 p.m. on Thursday at the Public Safety Building is concentrated on the residential aspects of the plan. According to the application filed with the city for a planned unit development (PUD) and conditional use permit, the project will encompass 33.13 acres on land zoned for commercial and residential use. It will be a mixture of 18 single-family homes on large lots, 230 cottage homes and 51 multi-family residences. It will also include a 4.4-acre parcel destined for future commercial development. "The proposed neighborhood will feature active and passive open space areas for use by the residents," the application from 3J Consulting states. "The proposed design includes a network of open spaces and wetlands, a thoughtfully linked pedestrian circulation system, and several pedestrian amenities. A neighborhood park is connected to the proposed development through a network of multi-use pathways which provide pedestrian circulation and recreation throughout the site. The development will utilize a network of public and private streets, as well as alleyways which will provide for additional on-street parking. Additional parking for residents has been provided in several off-street parking areas." Rux explained that there is a multi-step process that must occur before construction can begin on the project. Simply stated, that process starts with the adoption of the preliminary PUD, which can then be followed by installation of water, wastewater, stormwater and transportation infrastructure. Then a final PUD is adopted. "The application requires planning commission approval of the PUD and conditional use," he said. "This is followed by a public improvement permit from the city for the city public infrastructure improvements. There will also be an ODOT permitting process for improvements on Highway 99W. (Army Corps of Engineers) and Department of State Lands permits also need to be obtained. Finally there is the PUD approval process as noted earlier. Of course the planning commission decision could be appealed to the City Council for review." Rux didn't have a specific timeline on when home construction would begin. 3J Consulting said in its application that clearing of the land would begin in June 2019, grading soon after and utility installation is set for August and September of 2019. The schedule calls for street construction to begin in May 2020. In addition to adding to the town's housing inventory, the possibility that Crestview Drive could finally be linked to Highway 99W is an important aspect of the project. For many years Crestview Drive has been designated by the city and Yamhill County as being a vital component in moving traffic off the highway and toward northern Newberg. As it sits now, Crestview Drive has undergone some improvements to the span that dead-ends just south of its intersection with Birdhaven Loop adjacent to the proposed development area. The city reclassified the road a major arterial in 2007 in an amendment to the Transportation System and Comprehensive plans, and tied the Crestview Crossing development to the extension of the road down to Highway 99W. Rux said that in a separate transportation project, the existing section of Crestview Drive from the county line to Springbrook Road will be improved in a partnership between Springbrook Properties and the city. "It is positive to see a proposal to provide additional housing in the community and to provide housing to address the affordability issue noted in the application," Rux said. "The transportation improvements are also a positive for the community." In its application, 3J Consulting officials said they recognize that while constructing affordable housing is not a requirement under a PUD or a conditional use permit, it notes that the city has identified "a significant shortage of affordably priced homes within the city" and it intends to address that issue. "In recognition of the city's needs for affordable housing options, the applicant proposes to create five percent of the single family detached homes with price reductions and deed restrictions designed to create perpetual affordability," the company said in its application. The 12 single family homes constructed as part of this program will initially be marketed at rates which make them eligible for families earning less than the median family income as described within the city's definition of affordable housing, which occurs when a family spends no more than 30 percent of its income on housing. At closing, buyers must sign a covenant agreeing to limit the price of any future sale with an appreciation rate not to exceed either the Area Median Family Income rate or another acceptable index of income. The proposed affordable homes will require owner occupation and will be constructed at various locations throughout the development.